Bobby and Michelle Mongelli own Hogfish Bar and Grill and Geiger Key Marina but perhaps their proudest accomplishment is the Stock Island pizzeria Roostica. 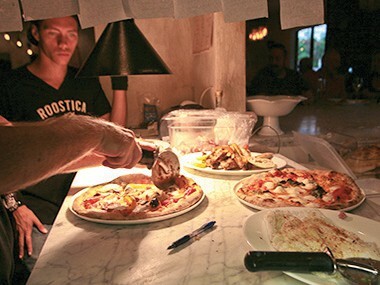 A favorite restaurant of Key West locals and visitors, Roostica is known for the pizza but also offers an assortment of Italian specialties. However, the pizza it serves is the highlight. 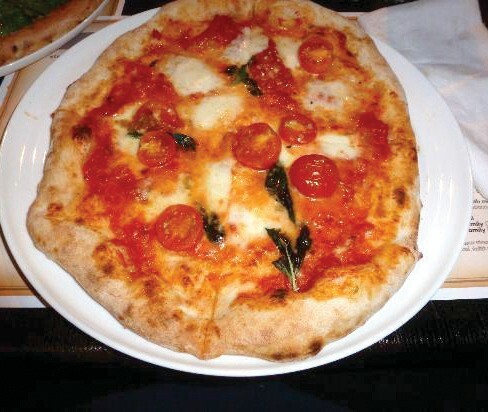 In 1998, the Italian government recognized Neapolitan Pizza as a traditional food worthy of preservation and granted it DOC (Denominazione di Origine Controllata) status. This status specifies the legally permitted ingredients and methods of preparation necessary to produce truly authentic Neapolitan pizza. Only soft-grain flour, fresh yeast, water and sea salt may be used for the dough. Only Italian plum tomatoes, mozzarella di bufala, extra-virgin olive oil, fresh basil or dried oregano may be used for the toppings. Fresh garlic may only be used on the Pizza Marinara and all Neapolitan pizzas must be cooked in a traditional wood-burning oven. Roostica offers three types of DOC pizzas: the Marinara, the Margherita and the Margherita extra. 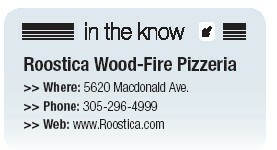 In addition, Roostica offers a large selection of red pizzas. My personal favorite is the Island Pie, which is topped by fresh local seafood. There is also a Shrimp and Pesto Pizza, Pepperoni, Meatball and Ricotta and many more. If you like white pizzas you will love the Truffles and Mushrooms, The Fig and Pig, The Parma Ham and Eggs or the Four Cheese. If that’s not enough, there is also a selection of calzones or you can custom make your pizza. Traditional Italian appetizers such antipasto, calamari, garlic bread, bruschetta, a selection of meatballs and various salads are a great start to your meal. Of course, a large selection of wine, beer and soft drinks will round out your meal. Check the website for daily specials or to see the Sunday brunch menu.